In this Creative Tutorial I'll show you my findings as I experimented with using Nail Polish as paint. Over the years I've seen many people experiment with using Nail Polish as paint and I've always wanted to try it. While I was out shopping with my wife and daughter I happened to see this funky color and thought I'd give it a try. Here are my findings. I wanted to see what this color would look like on a variety of colors and I happened to have these test spoons lying around so I figured I'd put them to use. From left to right: Bare Mr. Surfacer 1000, Alclad II Steel, Mr. Color Super Silver, Mr. Color GX Red Gold. I started by mixing the nail polish with Mr. Leveling Thinner until I achieved that milky consistancy. This particular nail polish is pretty thick, so I had to thin it quite a bit, but after that it sprayed really nicely and went on very smooth. As you can see the effect is hit and miss with this color, but the effect on the left two spoons is much greater. Unfortunately the pearlescent effect does not tranlate very well in photos, but it is much more prominent in real life. The effect on the Mr. Leveling Thinner spoon and the Alclad II Steel spoon are pretty nice. it has tones of green and purple at different angles and has a nice overall spectral sheen. I'm not sure how useful this particular color would be on Gundams, but it was good to experiment with. As you can see in the photos there are scratches on two spoons. 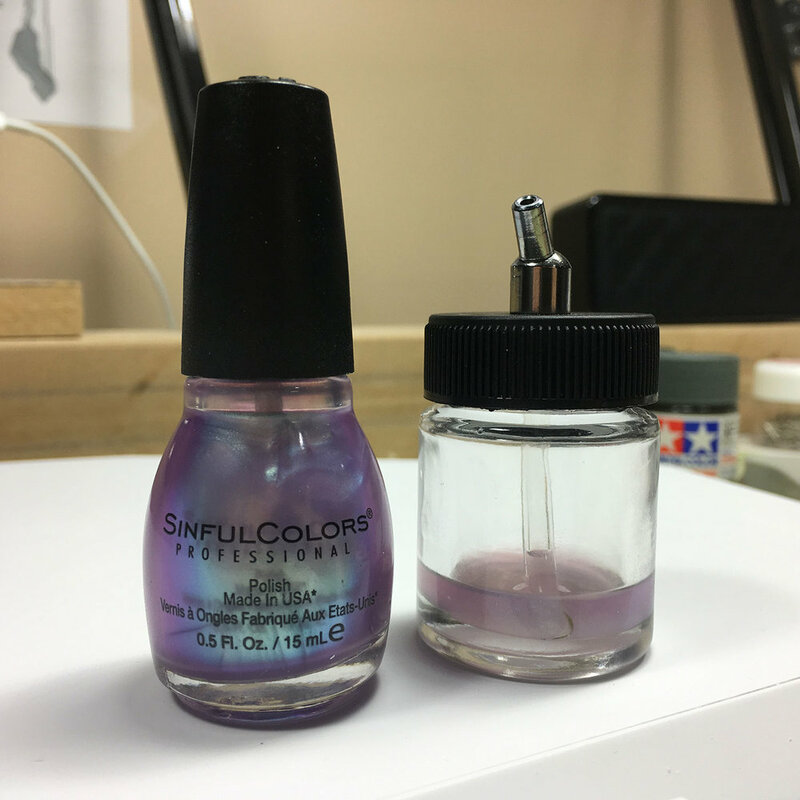 I wanted to test the durability of the nail polish compared to Mr. Color and other lacquer based paints. The scratches were done after about 30 minutes cure time. Mr. Color would have been rock solid at this point, but the nail polish, while dry to the touch, scratched off pretty easily at this point, so I decided to give it overnight to cure some more. Here you can see the Before and After shots. The left two spoons had a nice change while the right two spoons had little to no effect. After letting the spoons cure for 8 hours, I can safely say they cured to the same hardness and durability as Mr. Color paints. Very happy about that, but in the future I probbaly would NOT use Mr. Leveling Thinner, but instead use standard Mr. Thinner. I never thought about nail polish already having a leveling agent already mixed into the formula, so I'm guessing that adding more leveling agent slowed down the cure time significantly. Since standard Mr. Thinner doesn't have a leveling agent, I would hypothosize that it would decrease the cure time by a decent amount and still retain the same durability. CAUTION: Since all nail polish is formulated differently, both across colors and brand, it's absolutley crucial to test before spraying it on a model. Different brands may not mix well with certain thinners or may even harm the plastic. Even formulations of the same color and brand may be different in different countries, so PLEASE make sure to test out your colors! Overall I was very pleased with this test. Like I said before, I'm not sure how useful this color or even using nail polish would be in the future, as it's no substitute for dedicated model paint, but it's good to know that the option is there in a pinch.